With an indoor party, you know that everyone is going to mingle in the kitchen no matter how hard you try to get them to spread out. Outdoors, you can be sure that everyone will huddle around the beverages. 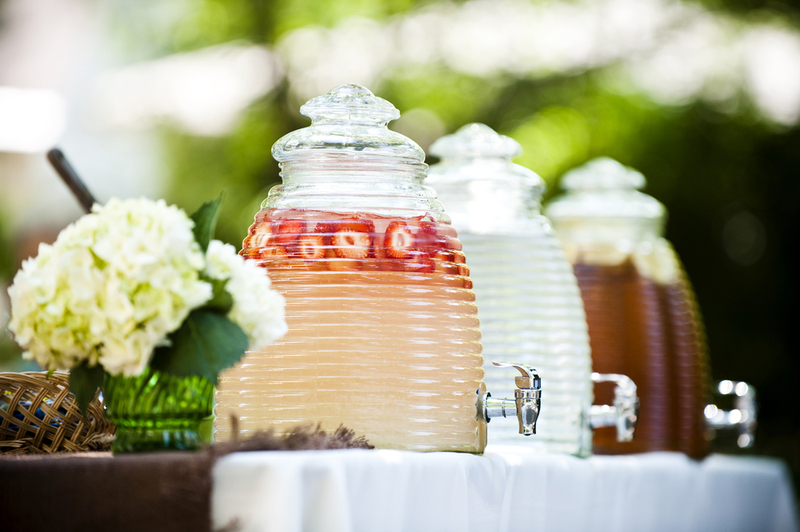 With that in mind, it’s time to deliberately make your outdoor drink station the focal point of the party. From family reunions and holiday bbqs to outdoor weddings and graduation parties, the summer is ripe with celebration. A beautiful self-serve drink station means no one needs to stand around and pour drinks. Everyone gets to mingle and guests will have fun creating personalized concoctions. You can go with just one theme and create a soda, lemonade or iced tea bar. Or, you can offer a little bit of everything. Adding some labels to dispensers or setting sings by the pitchers will allow guests to help themselves without seeking you out to ask which drink is which. I love to help friends and family with life’s little celebrations. It’s easy to create a wow-factor beverage table. The really nice part is that you can get much of it ready ahead of time and simply carry it out into place on the day of the party. Creating a simple plan is key. I’ve put together the steps as well as some great ideas for your next summer event. Since you are making the drink table front and center as a focal point, this is the time to show off. Start by deciding what you will use to hold everything. Folding tables or saw horses with tablecloths or even quilts are a good starting point. You can really glam things up by carrying out a decorative dresser or sideboard for the day. The old adage that we eat with our eyes applies to beverages too. The fruit punch or lemonade might taste the same no matter what you put it in, but it will look amazing in a glass beverage dispenser, pitcher or punch bowl so the colors shine and the fruit is seen. 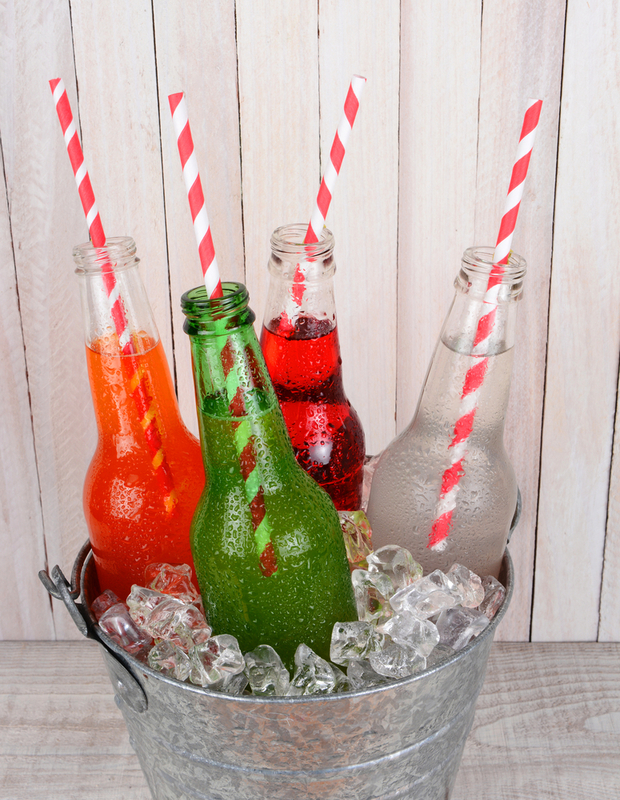 For visual appeal, choose glass bottles over canned beverages if you are offering individual drinks. Nestling the bottles in the ice makes everyone crave a cold drink. You can really have some fun with this idea by using interesting containers instead of hiding the drinks in a cooler. Dunk them in a galvanized bucket. Fill up a wheelbarrow, washtub or red wagon with ice and tuck in the bottles. For a baby shower, you could even use a baby bathtub. As long as the container is sturdy enough to hold the ice and drinks, you can let your imagination run wild. 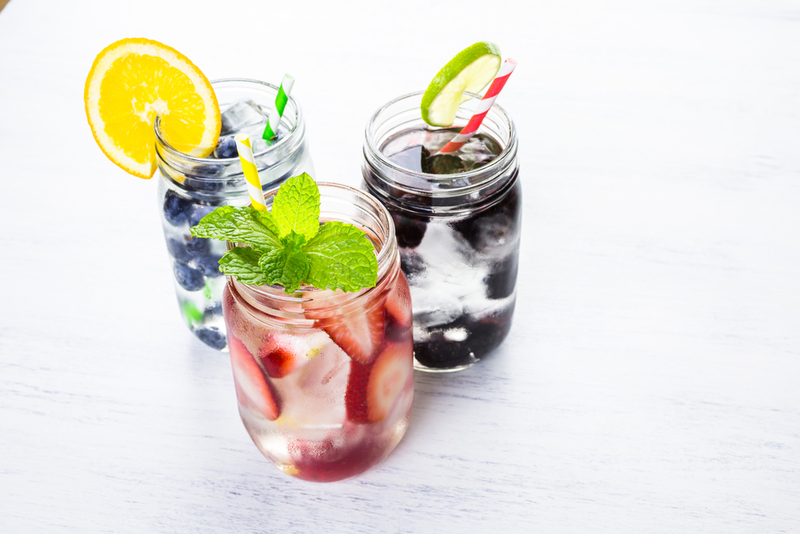 Remember to set out a pitcher of water, as well as some sugar-free drinks like unsweetened iced tea, for guests who can’t consume sugar or just want an alternative option. Of course the key to an outdoor cold drink station is ice—and plenty of it! You’ll want to make sure to stock up on ice and have some on back up. A great tip for handling ice for a group is to get a freestanding ice maker. These countertop appliances are small and handy, yet they make pounds of ice. They can easily be left out for the party and then tucked in the cabinet until needed again. Continue the fun and grab colorful drink containers. 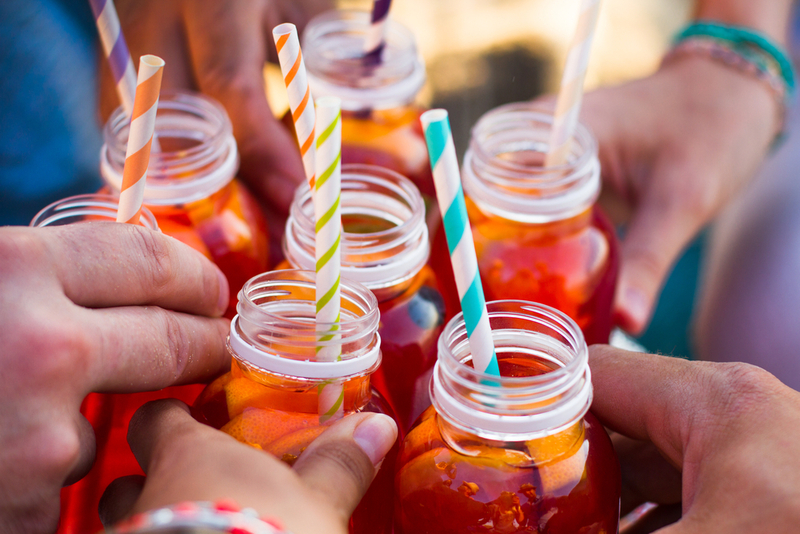 For an outdoor event, you can get creative and use anything from glasses to mason jars to bright plastic tumblers. Even if you go the disposable cup route, you can still glam them up with tiny paper umbrellas or cute nametags. Sugared rims are easy to do, but might not be something your guests want to attempt. You can easily pre-sugar the rims for a gorgeous presentation. Place a small account of water, lemon or lime juice in a saucer. Dip the rim of the glass in the liquid, then dip the wet rim into a saucer of sugar. Use tinted sugar for a pretty effect. Garnishing the glasses is where your guests get a chance to have fun and really personalize their drink. Set out bowls of cleaned and sliced garnishes. It’s easy to mix and match a variety of garnishes with ice tea, lemonade, punch and sodas for unique beverages— and the garnishes makes them look so pretty. Some of my favorites include bowls of fresh blueberries and raspberries, sliced strawberries, skinny circles of cucumber, wedges of lemon and lime and thin pieces of melon. Sprigs of fresh mint and rosemary are best kept in a tiny bit of water so they stay fresh. 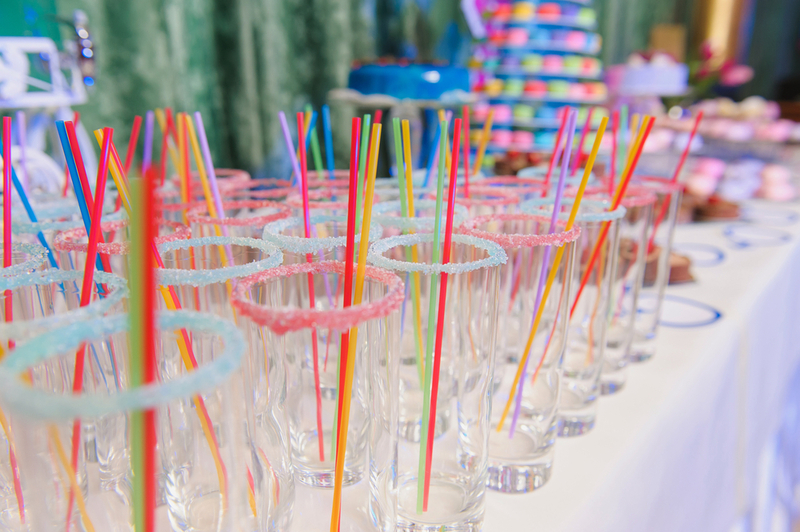 Colorful straws, skewers and drink stirs give more mix and match options. It’s really simple to pull all these components together so your drink station is not just a pretty focal point, but is also entertaining and delicious. Lea Schneider is an organizational expert who knows that good planning often translates into good times. Lea writes her advice on backyard parties and other outdoor activities for The Home Depot. 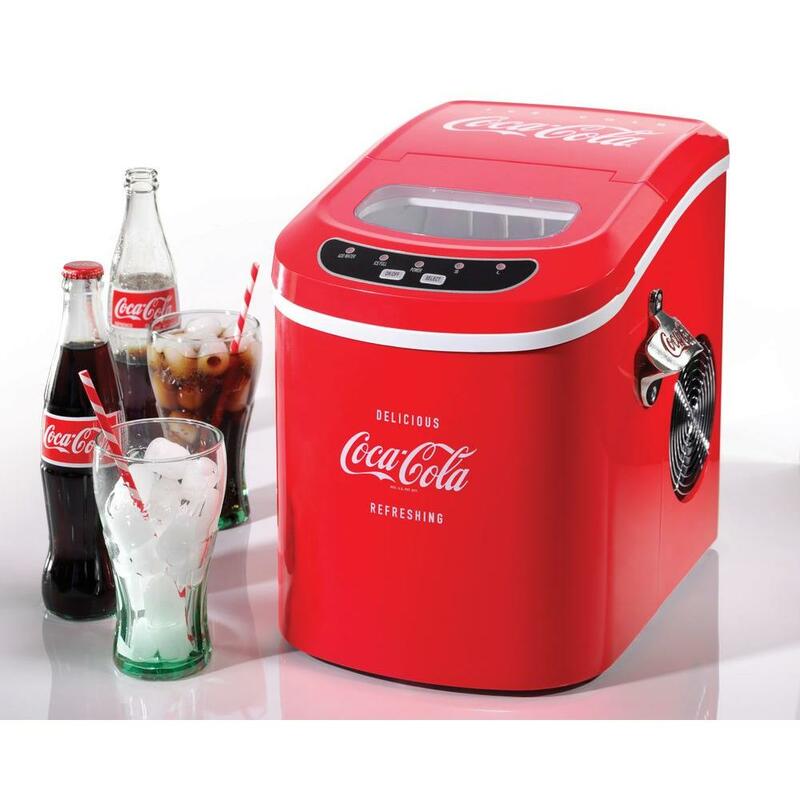 To review a wide selection of ice chests and freezers that may fit the bill for your next warm weather get-together, you can visit the Home Depot website.